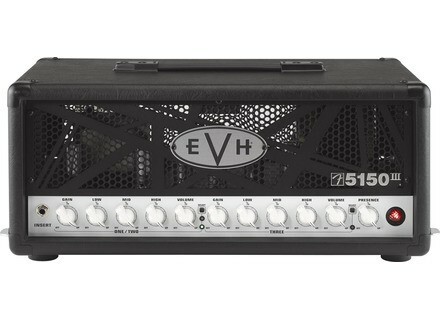 5150 III 50W, Tube Guitar Amp Head from EVH in the 5150 III series. 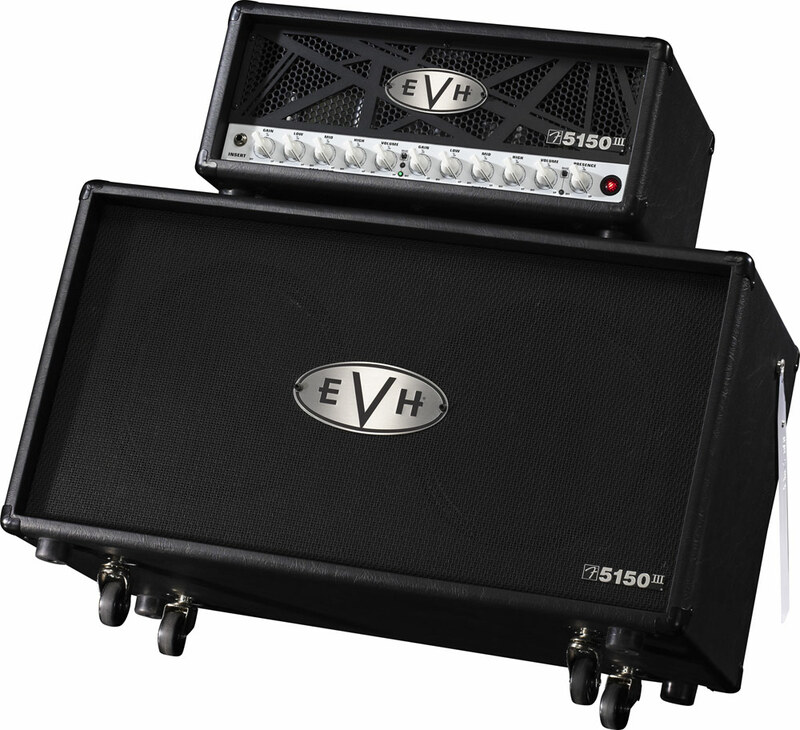 When Fender launched a new amplifier featuring a new "EVH" logo and the traditional "F" next to the 5150 III logo, questions were certain to rise. Rumors said this new monster is made for metal. There are too many secrets surrounding this new amp — it's time for me to jump into my van and find out the truth. 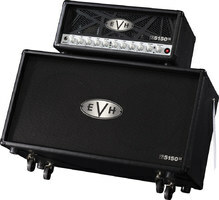 The front side of the head distinguishes itself by the number of distinctive signs — an "EVH" logo, a "Frankenstein"-inspired design, a Fender logo and the 5150 III name. What a mystery this new product is! I call in the famous "doctor" Robert Klaptone to help us understand all those "religious" signs. "EVH" is the acronym of the famous guitar player: Edward Lodewijk (aka Eddie) Van Halen. The man was a Peavey endorser from 1993 to 2004 when he regularly used the 5150 (which is also the name of one of his albums), renamed "Peavey 6505" after the separation from Eddie. Since then, Eddie joined the Fender artist roster, but with a quite unusual agreement. Mr. Edward founded his own brand called EVH leaving the full manufacturing process to Fender. This is the reason why both EVH and Fender logos are so close, while "5150" reminds the LP (and the sound of those days) and "III" just means three channels. Now that the context is cleared, let's have a closer look to the beast. If you have body builders among your friends, ask them to help you getting this beast out of the cardboard box because it weights "only" 35 lbs. If you like carbon finish, neon and brushed aluminum, look somewhere else. Here you'll find beautiful white or black Tolex depending on the version you chose. The aluminum front — inspired by the famous "Frankenstein" — provides it a lot of originality in a rather compact housing (12" x 20" x 8.5"). A perfect look! The F. team didn't forget about you, young musicians! A big footswitch is provided with the amp. It's built of steel (recalling a tank) and looks like it can withstand all aggressions of real life. It is equipped with four buttons, one per channel plus an effect button allowing you to switch on/off the FX loop. When it comes electronics it gets serious and heavy: 50 watts of output power with a V8 engine and nine valves. Six 12AX7 tubes for the preamp stage, one 12AX7 phase-driver tube, and two 6L6 power tubes providing 50W of output power and very high dB levels. Fender didn't spare tube quality: they chose JJ Tesla tubes, which are renowned for their long life, warm sound and smooth saturation. The front panel is quite comprehensive: 1/4" jack input, full EQ section (Gain, Low, Mid, High, Volume) with selector for channels 1 and 2, independent EQ section (Gain, Low, Mid, High, Volume) for channel 3 (with selector as well), and a Master Presence control for all three channels. The rear panel is also comprehensive: MIDI connector, FX loop, preamp out, two 1/4" jack speaker outs with impedance selector (4, 8 and 16 ohms), and resonance control. The unit is equipped with a fixation system to the speaker cabinet (of the same brand), so that you have the possibility to tilt the stack for better sound dispersion. I connect the head to my 2x12" Greenback speaker cabinet and I plug my guitar. Some amps are very docile: just put everything to 12 o'clock and rock! Van Halen's gear doesn't belong to this category... With channel 1 (clean), the sound is sharp with emphasized high-mids. The EQ can't satisfy all my expectations and doesn't really balance the tone. The latter reminds me of an old radio receiver. I'm about to cry shame when I suddenly remember the controls on the rear panel. The resonance control allows you to add warmth and depth to the sound, which will help enhance your tone. Even with the best settings, the clean sound is not warm enough and a bit too "straight" both with the bridge and the neck pickup. But since this amp is conceived for big rock and metal sound, the small clean sound is forgiven. Let's switch to channel 2 (crunch). First problem... the output volume is much too loud compared to the clean sound. For instance, setting the volume control to 4 in channel 1 produces the same perceived volume as channel 2 with volume set to 1. But let's forget about this small detail — it's time to rock! With gain at 12 o'clock, you get a lot of saturation and present lows, the ideal tone for 80's hard rock. The sound is an invitation to play "Carry On Wayward Son". Pushing the gain a bit more you get a vintage metal sound, for example to play "Hell"s Bells"! Did you say flexibility? The moment you're all waiting for has come: I jump on the footswitch to switch to channel 3. I was expecting the same output volume as in channel 2, but the volume is actually more like on channel 1. Channel 3 sounds like channel 2 but with even more gain. The sound is modern and aggressive with sharp high-mids, in the heavy metal tradition of Eddie. At maximum gain, the bridge pickup might seem a bit too aggressive, but don't forget the small resonance control on the rear panel to add more depth to the sound. I switch my small spring reverb on — by the way the FX loop works perfectly — and I'm ready for the "5150" riff from Eddie's '86 LP. It's just a pity that I can't sing! In short, channel 3 is dedicated to big sound and it does its job wonderfully! Fender offers a very good product to all big-sound fans (and all Eddie fans). This small racing engine goes for about $1,333 (MSRP), which is quite affordable for an all-tube 3-channel 50W amp. We missed a small reverb to bring warmth to the sound. And let's don't forget the difference in output level in channel 2, which makes it almost impossible to use on stage or during rehearsals. I recommend this amp to all musicians who are looking for a big sound, reliability and good finish quality!